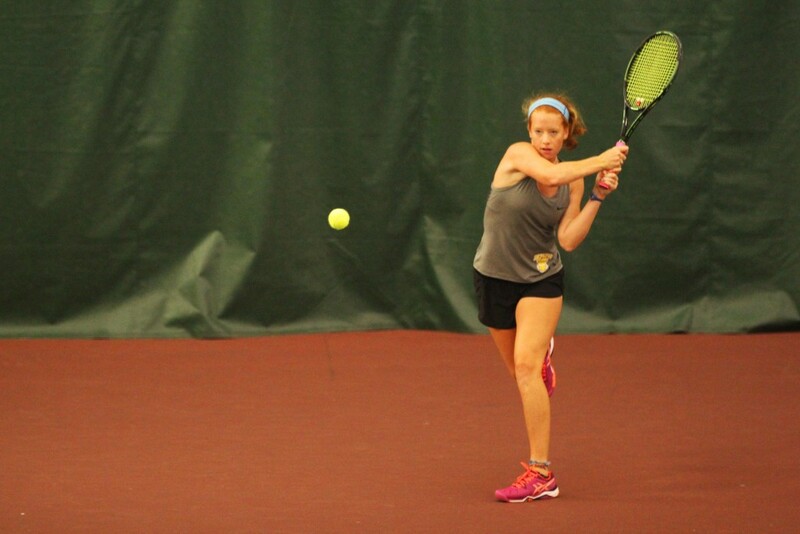 The DePauw University women’s tennis team opened their season with five single wins and two doubles wins in their own invitational this weekend. Junior Alyssa Seneviratne defeated Daria Bondareva of Walsh University 6-3, 6-2 in number two singles. Sophomore Sarah Wilder also got a win at the third singles over Hanover College’s Meghan Farrell 6-1, 6-4. Wilder sees improvements from the team this year compared to last year. It was a DePauw versus DePauw fourth singles match with sophomore Colleen Morris defeating sophomore Nicole Pamphilis 6-1, 6-1. Senior Morgan Cohen continued DePauw’s winning streak with a 6-2, 6-2 victory over Walsh’s Snezhana Kiseleva. Head Coach Scott Riggle was impressed with his team’s opening performance. “It was a great start to our season. We are already ahead of where we were last year and are playing some good tennis,” said Riggle. The Tigers took home third place in the NCAC Championship last spring. During the spring, Senior Maddie Lee was named first team all-NCAC while Seneviratne and Wilder were named NCAC honorable mentions. The team’s next match is on Saturday, Sept. 10, when they travel to Indianapolis for the Butler Invitational.